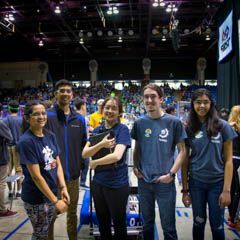 The US Robotics Team participated in the Silicon Valley Regional FIRST robotics competition in San Jose the weekend before spring break. Out of 60 teams, Gryphon Robotics ranked 6th — the highest ranking for the school's team to date. Even though the team qualified to be alliance captains for the quarterfinals, the team was unable to reach the semifinal round. Great job to the entire team for their hard work, dedication, and perseverance. Go Gryphons!